Determining which of your teeth is causing your toothache isn’t always easy — or even if it’s a tooth at all. The pain could be coming from a tooth, the gums, or both. Only a thorough dental examination can pinpoint the exact cause and best course of treatment. If a decayed tooth is the problem, the pain may be coming from nerves and other tissue deep within the tooth’s pulp. The symptoms could be dull or sharp, constant or intermittent, specific to one area or spread out. It’s even possible for the pain to suddenly subside after a few days. This doesn’t mean the infection has subsided, but rather that the infected nerves have died and no longer transmit pain. Pain can also radiate from the actual source and be felt somewhere else — the pain in your sinuses, for example, could actually originate from an infected back tooth. If the source is periodontal (gum) disease, the infection has begun in the gum tissues. As they become more inflamed they lose their connectivity with the teeth, bone loss occurs and the gums may “recess” or draw back. This exposes the tooth root, which without the protective cover of the gum tissues becomes highly sensitive to changes in temperature or pressure. 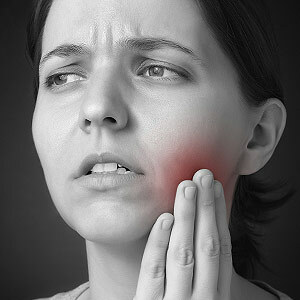 As a result you may encounter sharp pain when you eat or drink something hot or cold, or bite down. Treating these issues will depend on the actual infection source. An infected tooth often requires a root canal treatment to clean out the pulp and root canals of dead or infected tissue, fill them with a special filling, and seal and crown the tooth to prevent future infection. If the source is gum disease, we must manually remove the bacterial plaque causing the disease from all tooth and gum surfaces to stop the infection and allow the gums to heal. In advanced cases, surgical procedures may be necessary to repair damage and encourage new gum and bone growth. Where dental disease has spread from tooth to gums or vice-versa, you may need treatments for both areas to address your overall condition. Whatever the treatment course, we can put an end to your tooth pain and restore health to your teeth and gums.